The Village of Pentwater is celebrating it's Sesquicentennial this year! This 150 year celebration has us putting on BIGGER & BETTER FIREWORK DISPLAYS! We need your help! The Pentwater Chamber of Commerce is the only Chamber in the area to host two fireworks displays for you enjoyment. July 3rd and the Saturday of Homecoming. Whether you're a lifelong resident, annual visitor, newcomer, business owner, organization, this is why you understand the importance of supporting our local events. We have two spectacular firework displays in Pentwater. They are annually held on July 3rd and the Saturday of Homecoming in August. These shows are for your personal viewing and to help attract more people to your business/organization. The 87th Pentwater Homecoming Celebration is being held August 10-13, 2017. This annual event is in its 87th year for a reason. People have been enjoying "coming home" to Pentwater for years. It's a family/friend tradition. We hope to continue the annual Firework display that Saturday for your enjoyment. We have an even bigger goal this year. The Village of Pentwater is celebrating it's Sesquicentennial, 150 Years, this year. We are hoping to have BIGGER & BETTER FIREWORK DISPLAYS for July 3rd and the Saturday of Homecoming (August 12th). Drop it off in our mail slot in our door or stop in - 324 S. Hancock St. This year Charles Mears State Park is doing their part by having a can return container for your returns. Please only put your recyclables that will generate the 10 cent refund. Limited Edition Pentwater Print - Petrus Martens of East Lansing has produced an original print inspired by the Pentwater Fireworks, Village Green, Yacht Club, Channel and Gazebo. He has been an exhibitor at the Pentwater Fine Arts and Crafts Fair in the most recent years. He will return to it on July 8th with the limited edition. The artist has generously offered to donate 20 percent of sales to the Firework displays. Each print measures 13"x19" - priced at $50. One will be able to purchase it at his booth at the July 8th show or online at www.martensprintworks.com This limited edition is going fast! Get yours today. SOLD OUT! Limited Edition Sesquicentennial Collectible Plate. 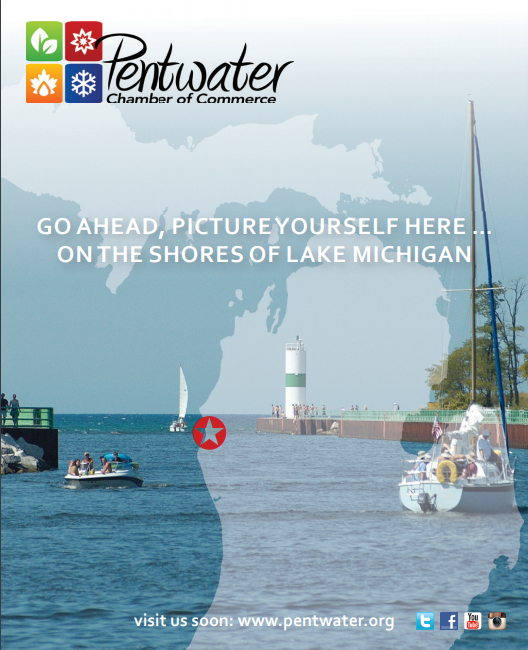 Purchase yours at www.pentwater.org or at the Chamber office. The Pentwater Chamber of Commerce is proud of all the support we receive for our fireworks. We hope you know that your contribution is greatly appreciated. We also want you to have pride in the town where you visit or live. Please help us keep these traditions. Everyone has a favorite display so we hope to make all happy by continuing the tradition of July 3rd and Homecoming Fireworks.